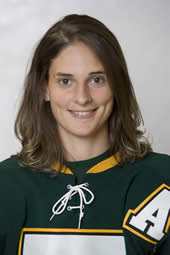 Lucrece Nussbaum, fresh from a 5th place finish at the Olympics, has been named a 2nd team all-star on defence. Speedy Amy Kellbaugh and Kristin Wolfe have both been named to the AUS rookie squad. CHSR plans to cover St. Thomas games at this weekend's tournament in Moncton. A couple of great pieces by our very own music director of the St. Thomas Tommies hockey games. Great work Mike.....GO LEAFS...Thumbs up! In the regular season finale at the LBR, the story of the game was Moncton's potent powerplay and STU's missed opportunities. Five on five the Tommies were equal to or better than the Blue Ealges but the extra attacker propelled UdeM with all 3 goals and almost one quarter of their shots. The first period was scoreless with STU holding the better of the play out shooting Moncton 13-10. The Tommies had 4 glorious chances to take the lead but UdeM's goalie Kathy Desjardin was the difference maker. In the second frame les Aigles Bleues scored on the PP at 6:49 when Janelle Ouellete fired the puck from the left face-off circle and Kristine Labrie potted the goal off a perfect deflection. Valerie Boisclair would get the next power play goal at 16:58 from Kristine Labrie. STU out shot Moncton in the second period 7-6. Captain Dominique Bernier would get STU close at 9:17 of the third when she fired home the Jillian Couglin pass to make it 2 to 1. Janelle Ouelette would round out the scoring at 12:54 beating Julia Sharun in tight. Final shots favoured the Tommies 30-26. With the loss the Tommies do finish in fourth position but this ultimately may be a small blessing. STU should be in the same pool as UPEI and Moncton at the playoff tournament being hosted by UdeM next weekend. If the Tommies make it to the finals against St-FX they will receive the automatic backdoor berth to nationals being hosted by the X-Women. Lucrece Nussbaum scored her first Olympic goal and Switzerland's third goal of the game (on the PP), as the Swiss cruised to an easy 6-0 victory over China. The Swiss will have one more game to play versus Russia to determine 5th place, game time is 1 AM (AST) on Tuesday morning/Monday night. Please rest assured we will be looking for video of this goal. The Tommies lose 4-1 to UPEI tonight on the Island, couple that with Saint Mary's 4-2 win versus Dalhousie, and STU sits one point back of the Huskies for third spot in the league. St. Thomas out shot the Panthers 24-17. STU's only goal came off the stick of Kathleen Boyle (Bernier, Kelbaugh) at 15:05 of the second period making the game 2-1 at the time. PEI would score one more in the second and one more in the third for the 4-1 final. Julia Sharun takes the loss in net. Next game for STU is Sunday afternoon at 3 PM against first place Moncton. This will be the Tommies final home game of the season. Some much deserved media attention for CIS women's hockey. John Bower and Stuart Bowlen team up and do a great job going over the week that was in CIS women's hockey. A few clips of Sunday's shoot out win versus Saint Mary's included, so check it out. Also interesting to note that this past weekend was not a great one for those CIS teams looking to have a perfect season. Not only did UNB lose to St-FX locally in men's play but the Laurier Golden Hawks were denied perfection by the Windsor Lancers in women's action. Nice accomplishments by both teams nevertheless. Final game of the round robin for the Swiss is Wednesday versus Slovakia. GO LUKEY! The Tommies finished their season in Halifax with a 7-4 loss to the Saint Mary's Huskies. There is no way to sugar coat this folks, we miss the play offs for the second straight year and finish with a 7-19-2 record good for 16 points. Scoring for the Tommies tonight were Jordan Scott with his first of the season, Scott Judson, Devan Praught, and Kenton Dulle. Comments have been turned back on. STU fans, we are just like you...frustrated and tired but take a few minutes and think about what you are saying. Vent your frustrations but Please, if someone is an optimist, let them be. And for you optimists, let the frustrated fans be as well. We are all in this together. I don't think the powers that be read this anyway. It was just a fun way to support our hockey teams, it was never envisioned to be what it has become. Just getting tired, that's all. 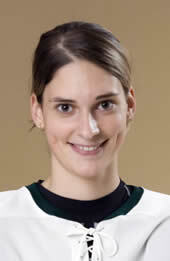 The Swiss women and the Tommies own Lucrece Nussbaum fell this afternoon to Sweden 3 - 0 at the Vancouver Olympics. In 19 minutes and 21 seconds of ice time today, Lukey was a -1 but was solid. Next game for Switzerland is against Team Canada on Monday afternoon. GO CANADA...sorry Lukey. Everywhere you look these days the opportunity for women to play the best sport in the world continues to grow. From Timbits in minor hockey right up to the University level, females playing hockey isn't the "surprise" it once was. For example the annual World Pond Hockey tournament held in Plaster Rock, NB has added a women's division for the first time. A team comprised of former Tommies currently hold top spot at the tournament. We have our fingers crossed that Catherine Boudreau, Amy Nelson, Rebecca Connors and Sarah Braamm can bring home the championship and have "Has-Been-Tommies" (all former St. Thomas players) added as the inaugural winners of this tournament. This cruel hockey season is almost over for the Tommies. With a 5-2 loss at the hands of Acadia the Tommies are confined to the AUS basement and no chance at a playoff position. Scoring for the Tommies this evening were Corey Banfield and Devan Praught. Shots on goal were 37 to 37. It really doesn't matter but the Tommies could not catch a break tonight to save themselves....literally. It was 1-1 after one, 3-1 after two, and your 5-2 final. The comments have been closed on this post. Give it a rest for a while people and calm down for a bit. Several of the walking wounded played this afternoon for the Lady Tommies but it was Moncton that walked away with the win, defeating the Tommies 5 - 2. Charity Walls, Jessica Holt, and Katie Brewster were all in the line up. It didn't take long for the Aigles Bleues to get rolling. Janie LeBlanc scored 18 seconds into the game to stake Moncton to the early lead. It would grow 77 seconds later as Moncton crashed the net and Marieve Provost scored for the two goal cushion. In fact they crashed the net and goalie so hard that Kristin Wolfe had to be taken to the hospital. She suffered a concussion and bruised spine. The goal stood and Julia Sharun was forced to take over less than two minutes into the game. Marieve Provost, with her second of the game, would score at 15:31 to widen the gap to 3. Shots favoured Moncton 11-8. The second period would see U de M surge ahead by four goals at 1:32 off the stick of Janelle Ouellette. That was the only goal of the period as Moncton out shot St. Thomas 8-5. STU would counter early in the third when Katie Brewster snapped a quick shot from the low slot for a goal at the 42 second mark with the hard earned assists going to Charity Walls and Dominique Bernier. Moncton's Kristine Labrie would regain the four goal margin at 11:32. Charity Walls countered at 17:08 from Kayla Blackmore and Katie Brewster to make it a 5-2 UdeM victory. The Lady Tommies fought through their short bench and defeated Mt. Allison 1-0 in Sackville this evening. Julia Sharun faced 24 shots for the shut out victory. There was no scoring in the first period with both teams registering 8 shots. The Tommies picked it up in the second frame out shooting the Mounties 13 - 8 but STU could not solve Jennelle Hulan in the Mt. Allison net. In the third period STU came out strong and were finally rewarded at 12:15 when Kayla Blackmore carried the puck over the the Mt. A blue line, Kelley Matthews drove to the net bringing two defenders with her. This allowed Sweet Caroline Hammerheim to go unchecked on the far side and when Blackmore's shot rebounded, Hammerheim shot the puck home. This was all Sharun would need as the Tommies dominated the third out shooting the Mounties 22-8. Charity Walls and Jessica Holt did not dress for this game. Next action for the Ladies will be Sunday afternoon in Moncton against first place U de M.
UPDATE: Jason Cassidy passed along the original CBC audio interview that led to the Aquinian feature we linked to in this week's Tombits. Enjoy on YouTube. STU's Olympian: Fresh from the Aquinian, Jason Cassidy catches up Lucrece Nussbaum, who will represent Switzerland at the Vancouver Olympics. With a play off position slowly slipping from their grasp the Tommies couldn't get the needed W on PEI. The Panthers took the game 5 to 2. The only goal in the first period was scored on the PP at 9:22 by Chad Locke. Corey Banfield rang one off the post during a PP but STU could not capitalize on three man advantages in the period. Shots were 11 to 7 for UPEI. Matt Carter scored early in the 2nd period on the PP and Thomas Waugh at 16:47 for a 3 to 0 Panthers lead. Brad Gallant narrowed the lead 21 seconds later on a nice pass from Wes Welcher and Andrew Estey. Shots on goal were 13 to 12 for UPEI. The third period saw Corey Banfield, who was back in the line-up for the first time since before Christmas, score at 17:30 to reduce the deficit to one. Trying to tie the game late, STU pulled Charles Lavigne, and it back fired with 2 empty netters by UPEI at 18:26 and 19:58.